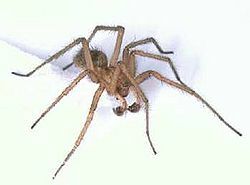 The Hobo spider is known as an aggressive spider that comes into the houses of people and leaves a very nasty bite. This spider can be fairly large with the female can reach up to 15mm. 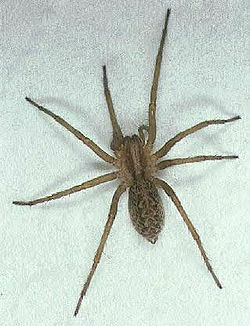 The Hobo spider catches its prey by forming silk traps that it will wait for an insect to fall in. Then when the insect is trapped in the webs he will use paralyzing venom and wrap its prey. This page was last modified on 28 March 2009, at 11:52.